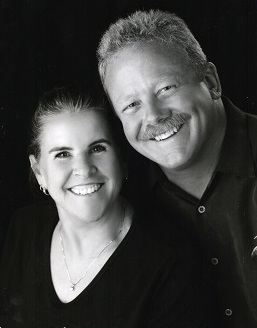 Pat began square dancing in 1977 with his parents in San Diego, California. In June of 1980 the club he danced with had an Amateur Callers' Night and though he was scared to death he was clearly hooked. His first professional dance came in September of 1981 and he picked up a regular gig in January of 1982. He now calls worldwide from Mainstream through A2. A pianist since age six, Pat arranges all of Shakedown Records' music and performs most of the music heard on the records. Pat calls over 200 dances a year, including National conventions and festivals. He holds a Bachelor's Degree in Public Administration from San Diego State University, and an Associate's Degree in Administration of Justice from Miramar College. Pat and his wife, Monica, started dating nearly thirty years ago, but, like many young people, split up and went their separate ways. They got back together in 2004 and were married in their backyard August 2nd, 2008. Pat has called and taught classes for a number of clubs in Southern California; currently he's teaching classes for the Riverside Single Swingers and the Calico Quails of Yucaipa. Known for calling and teaching in an all-position (DBD) format, he’s doing his best to improve the dancing level of the Inland Empire. He loves calling and singing to modern music. His goals include increasing the number of younger dancers by erasing old stereotypes and showing people that square dancing has modernized and is an entertaining pastime. In October of 2007 Pat relocated to Menifee, California. Still a full-time traveling caller, be sure to keep checking the Schedule Page for Pat's next exciting dance!